I am building this site to display some of the photo collection we have inherited from my great-grandparents, Anna and Leander Chindahl. 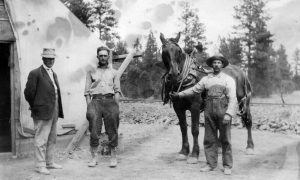 I have been scanning the old collection of images that were a record of the work and play of the Carlson, Chindahl & Co. Great grampa documented the construction of their jobs and the crews and family. The time frame seems to be from 1912 into the 30s. I am just sorting out the contents. There are jobs on the Snake river, the Yakima river, the Bitteroot river, near Rosalia, and on the Columbia river. The home base was in Spokane, Washington state, but they seem to have worked in Idaho, Montana, and Utah, as well. I hope we can merge some of this history with other sources to piece together some of the stories of the bold construction projects. If you have an interest in these events, I would be happy to share the collected images.